Part of me can't believe that the day and age of cassette tapes has pretty well passed. Sure they are still around, but I imagine that my children will probably never use them. That makes me sad. 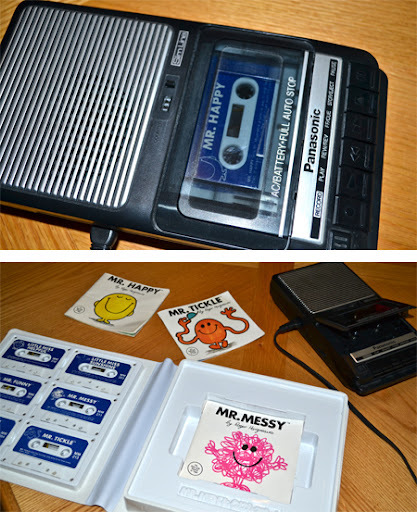 I remember recording my favorite songs from the radio on my boombox and making the most awesome mix tapes. I remember me and my siblings recording ourselves reading bedtime stories for each other or the fun of hiding the tape recorder under a table and capturing the, sometimes surprising, goings on in the house. 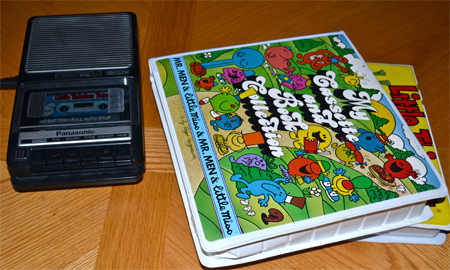 One of my favorite memories though, is that of sitting at the kitchen table listening to the Mr. Men books on tape and the Little Thinker series tapes. When I moved out of my parents' house, I took those two sets with me. They have been sitting in storage ever since. I didn't even have a tape player to use. One rainy afternoon later and I've got the kids hooked. It was really fun showing them something that they have never seen before. The Roger Hargreaves tapes are a real treasure. I'm not sure who the narrator is, but in this case, the narration actually makes the books better. I've been trying to find the tapes on CD. It doesn't look like it exists, so I guess I'll have to figure out how to record them myself. I would hate to lose this great collection. 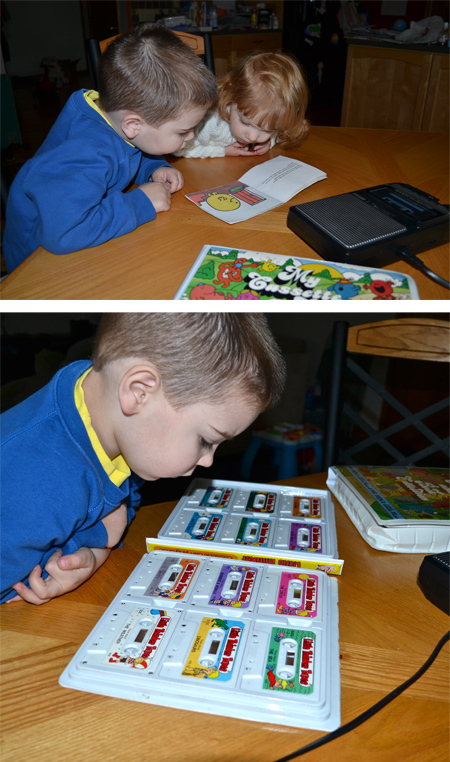 The Little Thinker tapes were a little advanced for Jellybean. They take the listener on an adventure and ask you to draw the different places and people you visit. I love how they ask you to use your imagination and creativity. While Jellybean worked with her play dough, Buddy listened to one and made some great artwork. It was like reliving a little piece of my childhood...*sniff* It was also a little piece of heaven having both children completely occupied. Are you holding onto anything from your childhood that you plan to share with your kids? Do tell. 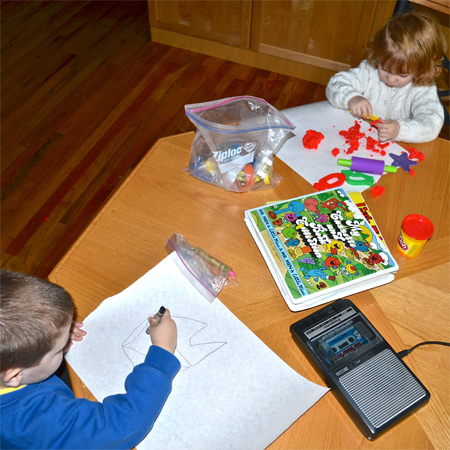 It is amazing how the technology from our childhoods becomes almost obsolete by the time we have children. I love that you saved the tapes and are bringing the fun to your children. They look like they had a great time.